I use to have a beautiful, fat, glittery Christmas wreath. But with all the moving and stacking over the years she didn’t survive. 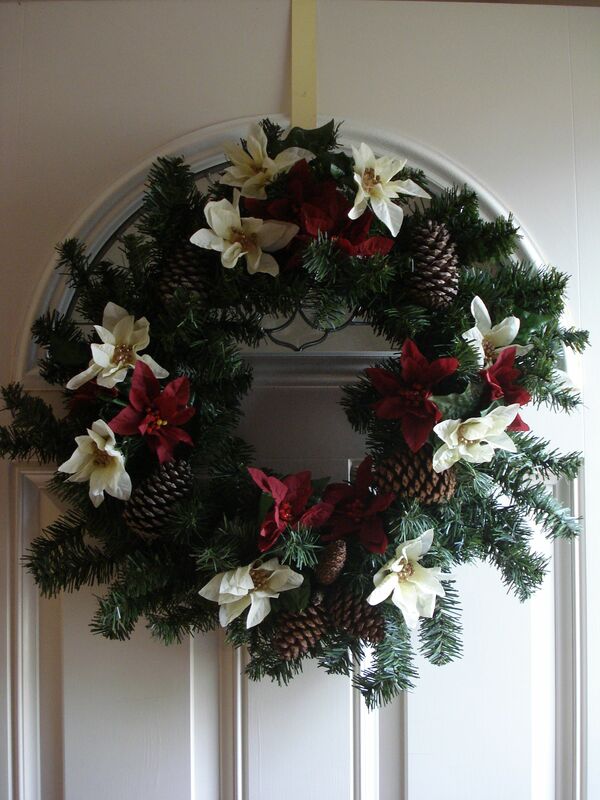 (Yes, wreaths are girls). I found a blank wreath at Michael’s and decided to throw caution to the wind and make my own. How hard could it be, right? I have lots of Christmas thingies at home and I could just hot glue them on…easy peasy! As it turned out I didn’t have too much of anything that would look good on a wreath and I was just too lazy to go back to Michael’s. So, I went up in the attic and found some old poinsettias and I walked up and down the street grabbing pine cones. I tried to pull some tiny pine cones off of the trees. But the little babies are in there pretty good and all I got from the tree is cut. I came home, got my glue gun out and I came up with this. It’s simple, and I kinda like it but in hindsight, it would have been a lot faster just to get off my rear and just drive to the store. I like it! I’m making new wreaths next year. Chris is sick of the fruit theme I’ve had going for over 5 years. I bought a lot of sparkly stuff at the Hobby Lobby sale last week in preparation. We’re planning to come visit on the 26th if that’s OK!